Measurements: 2.8 x 4.65 inches, or 70 x 118 mm. Back of card: Solid red field. 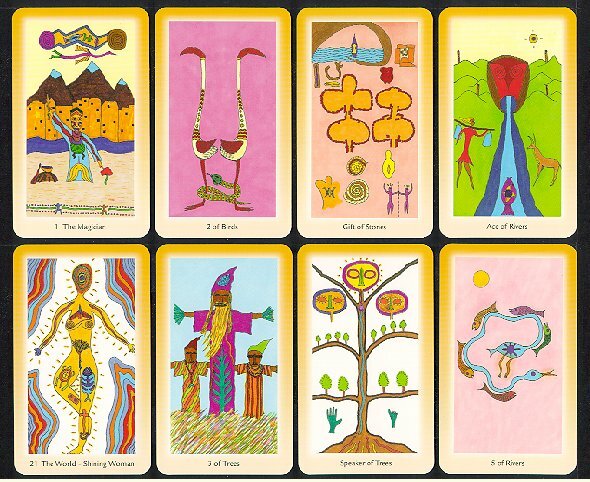 In the center, two yellow acrobats in outline holding each other's hands at the center of the card, their bodies & legs reaching off towards the ends of the cards. May be inverted. Book included: Yes, B&W illustrations, 331 pages, 6 x 9 inches, or 15 x 23 cm. The book, entitled, The Shining Tribe Tarot, Awakening the Universal Spirit is individually priced ($14.95), but checking the Llewellyn catalog, I cannot see they sell it by itself. If you need a book for this deck, contact them directly. Comments: Formerly known as the Shining Woman Tarot. I think Rachel Pollack is one of the finest of all tarot writers. She emphasizes looking at the cards and discovering what you find there. So it is with great expectation that we look at cards she herself has designed. This deck is excellent & will repay close study. Above, top row, are the usual four cards. The bottom row are just a few of the many fascinating cards in this deck. From the left: The Shining Woman, motif of the deck; the Three of Trees, reminding us of Calvary & the Trinity; the Speaker of Trees, with its Tree of Life motif; the Five of Rivers, with its spiral design. Enjoy the many fascinating stories Rachel Pollack tells with these cards.